In the summer, when there is an abundance of produce available from our 28 Island farms, it’s easy for Vineyarders to plan meals based on local, seasonal food. But even with the vernal equinox upon us, winter is still maintaining its hold on our gardens, so making a meal based on Island food can be a challenge. Rebecca Miller, farmer and co-owner (with her husband Matthew Dix) of North Tabor Farm in Chilmark, is up to the task. Ms. Miller said her family eats a lot of soup through the winter months. 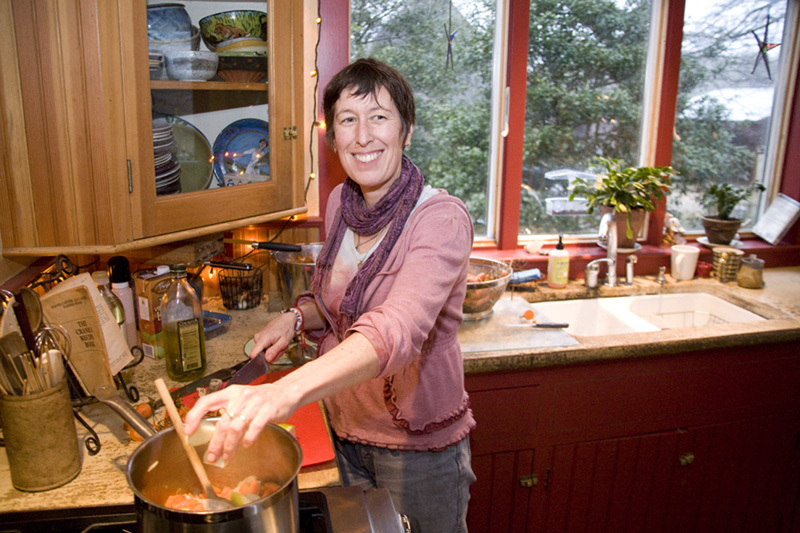 “One of our favorite soups is this carrot soup, topped with cashews,” she said. Ms. Miller is one of the founders of Island Grown Initiative, the nonprofit organization that actively encourages Island residents to “eat locally” and support sustainable agriculture. The group hosts speakers and potluck dinners, circulates a brochure that maps the locations of all Island farms, and has acquired a mobile poultry processing unit for Vineyarders who raise their own chickens so they also are able to process them on Island. She said the farm has just received Federal Department of Agriculture approval to sell pork, so in addition to their fresh greens, produce and eggs, North Tabor Farm also will offer Island-raised pork to Islanders. Her carrot soup satisfies vegetarians and meat-eaters alike, she said. “It’s so nutritious and hearty, and a little sweet, so really kid-friendly,” she said. Over the years, Ms. Miller has augmented the recipe to suit her family’s tastes, by sometimes using green apples instead of cooking apples. The original recipe calls for the vegetables and apples to be rough chopped, then sautéed in butter for five minutes before adding all other ingredients, including the nuts; next, bring to a boil, simmer for half an hour, then cool and liquify in a blender before reheating to serve. Ms. Miller sautés the nuts separately in tamari and maple syrup, then sprinkles them on top of the soup when she serves it. She also often waits a day, after cooling and liquefying, so the flavors really settle in. “Soup always tastes better the next day,” she said.